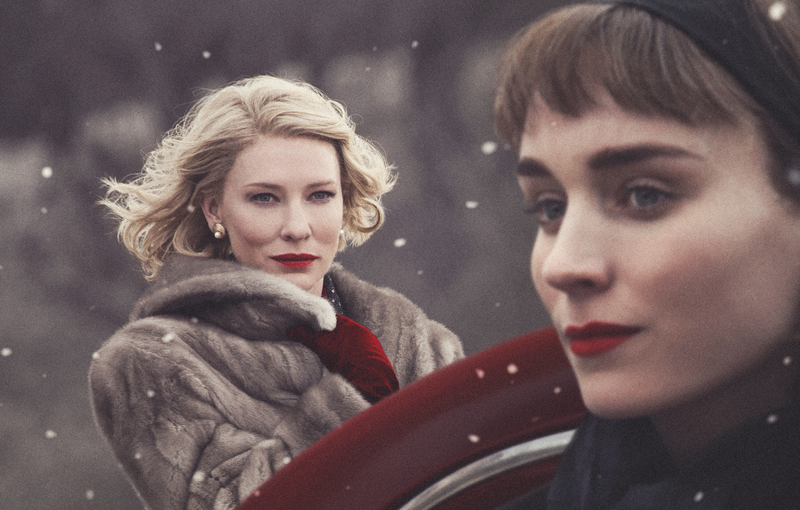 Set against the backdrop of grey sub-urban nights, a growing economy, and the middle class, Carol is a lightheaded melodrama in the 50’s revolving around a young woman named Therese, played by Rooney Mara, and her lesbian lover Carol, played by Cate Blanchett. Blanchett is famously known for her role in The Curious Case of Benjamin Button, and more importantly, for scoring the Oscar for lead role of an Actress in 2014 for Blue Jasmine. Directed by the century’s greatest independent filmmaker Todd Haynes, Carol is based on the book The Price of Salt, by Patricia Smith. The scene, half way through the movie, where Therese wakes up to find Carol leave, is one of the most thought provoking scenes depicting the fragility and the inconsistency of their relationship as it was for most lesbian societies in the 50’s. Carol is dominated by low key lightening from the first few scenes of Therese and her supposed boyfriend biking to work, to her working in the doll section of the store. Haynes smartly has no scene where Therese complains about her life; rather, he makes her work in the doll section of the store because just like the dolls, Therese lives in another world; she crushes on women and has a habit of saying yes to a lot of things like an exciting life of travel and leisure with her soon to be estranged lesbian lover. The scene begins with a full shot of both Carol and Therese, the two major characters in the movie. The hotel room is not too bright; a dimmer version of light is coming only from one side of the room giving one character more control than the other. In this case, Carol seems to be in power and Haynes does it in a very mature way because Carol is older, more experienced, and definitely wealthier than Therese. At this point, the two have already met and made love a couple of times, so there is zero tension in the air. The camera angle shoots from the corner of the room with a full shot of both Carol and Therese and Carol calmly says, “You don’t have to sleep over there.” At the end, Therese wakes up to Abby, (an associate and ex gay lover of Carol) smoking in the room with no sign of Carol. Due to the lack of dramatic response from Therese, it tells viewers that there is the possibility for the two to meet in the near future like before. Carol is a very sad movie and Haynes celebrates ‘unhappiness’ by portraying it through Theresa and Carol; both unwilling to give up on each other despite monumental risks. From the choice of a brilliant cast to an intricate pattern of scenes, Carol is almost perfect. If you love art, music, and revere poems that celebrate unhappiness, then Carol is your go to movie.